It's been a long road - five years long, if you can believe it - but the Gears of War franchise can finally take a breather with the end of the third game in the series. 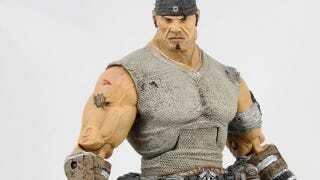 To celebrate, toy company NECA is releasing this "Journey's End" version of Marcus Fenix. If Marcus ever got an invitation to a firefight, and it said business/casual, this is what he'd wear. The top half? With the tank-top and the tattoos? It's casual. The bottom half? With the war pants and the enormous boots? All business, baby.